How is your Christmas shopping going? Feeling stuck? I promised you more Christmas gift inspiration, so here it is! How about a subscription or gift box? We have two fabulous subscription and gift boxes in our Directory – A Year Of Dates and mamaME Box. Both have been created with lots of love by two inspirational women, and are perfect for gifting to others, or to yourself! What I love about these two brilliant businesses is that they both share our Mums Off Duty values. They remind us that we mustn’t forget about taking time out for ourselves, just because we are busy mums. It isn’t always easy, but we must try! A Year of Dates, owned by Kate, is a great idea and encourages you to spend quality time with your partner. It’s so easy to neglect your relationship when you have a kiddie. I love this concept, especially if you struggle for interesting date ideas like we do! 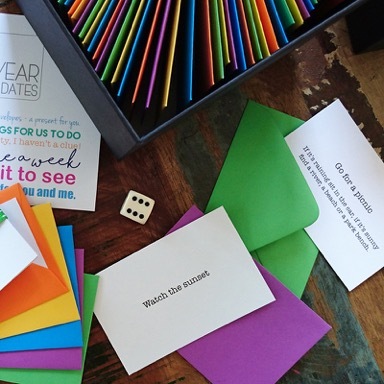 A Box of Dates contains 52 envelopes, each containing a fun idea for a date. Choose an envelope to open each week and follow the instructions. Easy! They can even be colour-coded in case you like to keep a little control over your dates. One week, you may prefer a ‘stay-in’ date, or another week you may be waiting for pay-day and need a cheap date! There is even a family-friendly version called A Year of Play, in case you need some inspiration for fun activities to do together as a family. The Christmas order deadline is Thursday, 14 December. mamaME Box encourages mums to enjoy a little me-time and is right up our alley. Helen, the owner of mamaME Box, features in our Magnificent Mamas series. A box full of lovely goodies is delivered to your door each month. Where possible, Helen sources the treats from mama and family-run small businesses. Goodies are different each month, but past boxes include treats like candles, books and pamper items. You can buy a subscription, or a one-off box – you may even just want to treat yourself! The January box (pictured above) is available to order until the end of the year. If you are gifting the box for Christmas, the recipient will receive a gift email and their box will be delivered in January. For more information on A Year of Dates and mamaME Box, please head to the Retail Therapy page in our Directory. It’s such an original idea, I love it. Yes, do it! You definitely deserve it! Oh wow good luck! How exciting! It is so easy to forget about you as a couple. I think it’s so important though to remember why you are together in the first place, and to try and find a bit of quality time together if you can!